NETWORK UPDATE: HAWAII 5-0 gained 0.1 in final numbers, but MASTERCHEF JR lost the same. CABLE HIGHLIGHTS: Discovery’s GOLD RUSH easily won the night despite dropping 0.11 from last week to 1.23. ESPN’s NBA doubleheader was at 0.71/0.68. 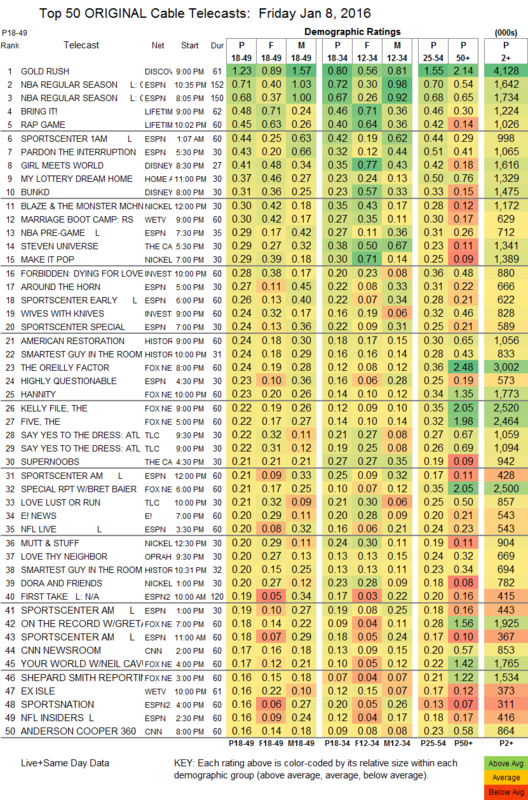 On Lifetime, BRING IT lost 0.09 to 0.48, and RAP GAME was down 0.06 to 0.45. Disney slotted 2 shows in the Top 10, GIRL MEETS WORLD at 0.41 and BUNKD at 0.31. HGTV’s MY LOTTERY DREAM HOUSE was at 0.37. MARRIAGE BOOT CAMP returned to We at 0.30. On History, both AMERICAN RESTORATION and the 10PM episode of SMARTEST GUY IN THE ROOM were at 0.24, and then the 10:30PM episode of SMARTEST GUY fell to 0.20. Two episodes of SAY YES TO THE DRESS were at 0.22 for TLC, with lead-outs LOVE LUST OR RUN at 0.21 and LOVE AT FIRST SWIPE at 0.15. OWN’s LOVE THY NEIGHBOR was at 0.20. 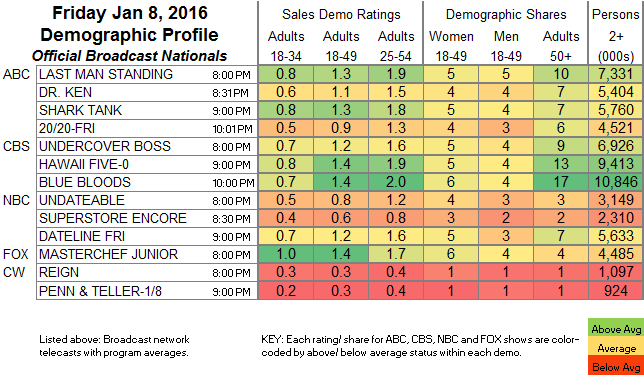 A&E’s UNFORGETTABLE ticked down to 0.13.